There's bolts in the middle of pulleys but it just spins the pulley. 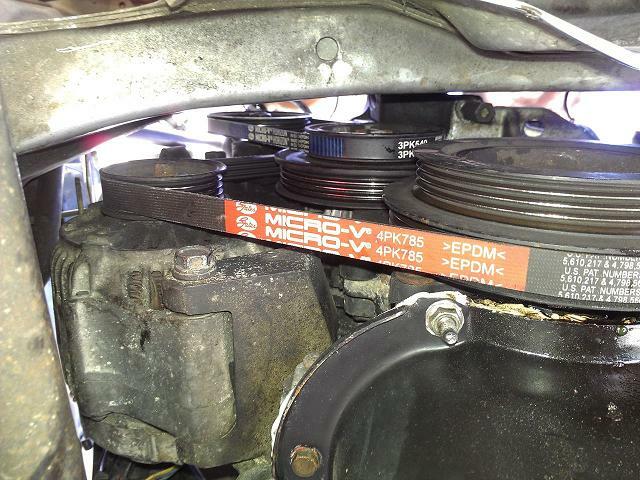 You really should get hold of some service information that has the procedure for removing and installing the belts. Trying sport to study pic and figure that out. Look at it. Seem orange belt is adjusted by alternator - right? The belt with the blue stripes on it possibly adjust from the back not the bolt that just holds the pulley on OR - perhaps they both snug up with adjustment of one. Haven't seen that since some "V" belt set ups - entirely not this style. As Discretesignals suggested, specific info for the exact vehicle and car would really help but you should see or feel something possibly from behind the two with the blue stripes. Can only speak of generalities for this without being right there. Most pulley bolts just hold them tight and not involved in the adjustment just there holding it in place securely and must do that too. They look new. What did you do go get them off? If you just removed the bolt(s) to a pulley and put a new belt on somehow that both should have exposed the way and WASN'T the way to adjust anything IMO. Thanks Tom, the tensioner bolt for the power steering belt was indeed on the other side at the back of it. I have found the tension bolt for the alternator now aswell. Have to jack the car up later today to try it. Call that totally a lucky guess but was right so far. Now - Belts seem new so proper adjustment is still important. New belts will break in or stretch some. Unless you do the same belts and same application all the time don't guess at how much too tight is right as that can and will harm bearings on things the drive. Rather see you go back and snug up usually if anything just once after some time of using the car. Pulleys should not spin by hand (engine off of course) or have too much "deflection" (may need to look that up) between longest distance between pulleys. Hi guys, this isn't really related to the pulleys and belts issue, but I felt it's best to continue on this thread instead of starting a new one. Whilst loosening the alternator some loose piece of metal fell and I think perhaps it fell into the alternator. Don't really know why it was there sitting on top of the alternator. My alternator is hidden under my power steering pump so I was just kind of blindly feeling around on top of the alternator and being my clumsy self, I fumbled it (perhaps into the alternator). So I tried to take off the alternator from the bottom, but there's no space. So I have to take off the power steering pump from the top to remove the alternator. However, I can't seem to loosen this nut on a hose connected to the power steering pump (see pic). The hose is metallic and I'm not positive where it leads. I'm thinking because it's metallic it may not be safe to remove. Is it safe to use more force to loosen this nut? Also, should I be really worried about something that might have fallen into the alternator, or is it no big deal? I'm a bit worried to connect it back up and to try and start the car. it makes it very hard to read script too. If convinced you can or send out alternator to be taken apart. HECK WAS IT AS IT WAS NEEDED SOMEWHERE? to fill properly later and keep debris out. at a time as needed or that's what I did. there's no telling what might go wrong MORE than just wrecking the alternator! have a clue until it's out just how that one works. Still don't think you have to remove it. Move unit whole, tilt engine if need be or something else. show up as a problem with something you didn't notice yet.